Today is Candlemas, a significant feast that has grown largely out of favor with Protestants these days. That’s too bad, because it’s one of those days that helps me stay grounded not only in the cycle of the church’s liturgical seasons but also in the cycle of Earth’s natural seasons, even in the cycle of life itself. 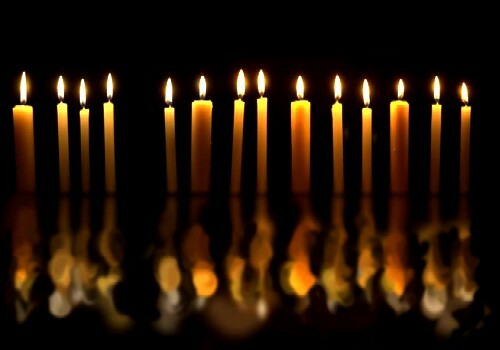 Candlemas is the Christian festival of lights. Following the shortest night and darkest season of the year, ancient people figured enough daylight had returned by this time to reassure them that the sun was not going to disappear forever, and the flickering candles of hope they had lit at Christmas could safely be extinguished as new candles for the coming year were blessed and put into use. Today is still seen by some as a good day to stow their Christmas decorations for the rest of the year. Candlemas falls midway between the winter solstice and the vernal equinox, and in many traditions it’s considered the beginning of spring. It surprises me that we don’t take more notice of that here in Western New York. In Western Europe, this was the time for preparing the fields for the first planting, when the ground is awakened and the seed placed in the belly of the earth. It’s a significant time for people who depend on the earth for their sustenance and livelihood, a time when the fields are purified and offerings made to invoke God’s blessing of the harvest yet to come. It’s a day not only for purifying and blessing the earth; it’s also a good day for purifying ourselves. Jewish women went through a purification ceremony forty days after the birth of a male child, so in the sixth century the church declared today, thirty-nine days after the birth of Jesus, as the Feast of the Purification of Mary. Candlemas, or the Feast of the Purification of Mary, became a good time for every Christian to be purified for life in the year ahead. The theme of purification became a link between the twin holy days of Christmas and Candlemas. Like many miraculous babies, Jesus was recognized from the time of his birth as someone extraordinary. Luke’s gospel tells how, at the time of Mary’s purification, Jesus was presented at the temple and recognized by the devout Simeon and the prophet Anna as the Messiah many in Israel had been waiting for – “a light for revelation to the Gentiles and for glory to [God’s] people Israel” (Luke 2:25-38). It took a while for that light to be fully revealed in Jesus, of course, and there was lots of exploration and discovery – and lots of misunderstandings and failures – along the way toward the light’s full brightness. Candlemas may mark the end of the Christmas celebrations for some traditions, but it’s only the halfway point between Christmas and the first great feast after the vernal equinox: Easter Day. Candlemas reminds me of the hopeful but not-yet time we’re living in today, between Incarnation and Resurrection. It reminds me that hearing about the light of life is not the same as living in that light perfectly, just as hearing Jesus’ proclamation that the reign of God is at hand is not the same as living perfectly in that realm. And Jesus’ recognition of the blessedness (some translate the word “happiness”) that belongs particularly to the poor in spirit, those who mourn, the meek, the hungry and thirsty, the merciful, the pure in heart, the peacemakers, those who are reviled and persecuted (Matt. 5:2-12), any one of whom could be one of us – that something of this blessedness has still to be given, or claimed, or worked out in the continuing struggle that is life. Our pursuit of happiness sometimes seems a long way from over. The quality of blessedness or happiness that Jesus says belongs to the poor in spirit and the rest is not something we gain by setting out to create those qualities in ourselves the way we check off items on a to-do list. They are qualities that accrue to us as we live faithfully the life we’re given. Happy are the poor in spirit, who are broken and have lost hope. Happy are those who mourn, who suffer loss and the feeling of emptiness that follows. Happy are the meek, who refuse to use power over others as a tool to make things happen. Happy are the merciful, who willingly surrender their privileges or otherwise go out of their way to serve the welfare of others. Happy are the persecuted, whose refusal to give up their quest for truth or virtue ends up costing them their rights, wholeness, or dignity. No, we don’t achieve happiness because of what we do; we harvest the fruit of happiness because of who we are. What we do is different. John Wesley had three rules for what we do: Do no harm; do good; stay in love with God. The prophet Micah used different words to say the same thing: Do justice; love kindness; walk humbly with God. To do justice means to restore balance in the community, socially, politically, and economically, so no one’s voice is unheard and so no one has too much and no one too little for a good, satisfying life. To love kindness is as simple as it sounds, whether it’s a banker refusing to foreclose on a family behind in their mortgage, a small child bringing a flower to the widow across the street, or any one of us offering a cup of cold water to the stranger who is thirsty. And to walk humbly with God is to maintain a sense of God’s presence in everything we do, in every place, and in every moment of life; it’s to be conscious of the God who is as present as every breath we take. That’s our visit to the temple for purification on this Candlemas Day, the blessing of the little candles we are as we bear the light of life into whatever darkness surrounds us. And with God’s help, by the flickering of our little lights, we will bridge the gap between Incarnation and Resurrection.